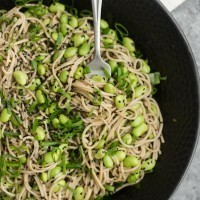 Sesame Soba Noodle Bowl with Edamame | Naturally. No matter how well I plan for a week of meals, I always seem to cut it close before I head back to the market/store. The refrigerator starts to feel a bit bare and usually the last dinner is a ‘toss together whatever I have left’ meal. However, one of my secret weapons is stashed in the freezer: shelled edamame. 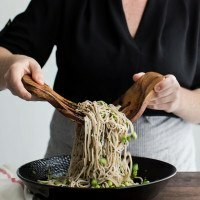 This sesame soba bowl is a perfect example of why I keep edamame in the freezer. 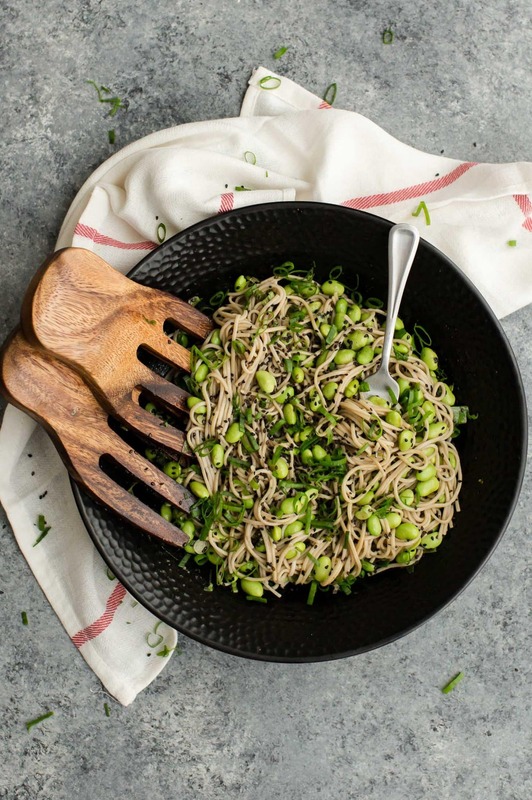 With a few pantry staples, like soba noodles, you’re only 20 minutes away from a solid dinner. Perfect for a quick weeknight dinner or those times when you haven’t made it to the store. Cook soba noodles according to package. Drain and toss with 1 teaspoon sesame oil. Over medium heat, add remaining 2 teaspoons sesame oil in a large pan. Add minced scallions, cooking for 3 to 4 minutes then measure in the edamame. Cook, stirring occasionally, until edamame is hot and starting to char on a few pieces. Whisk together the rice vinegar, tamari, sesame oil, and ginger. Pour over the noodles, followed by adding the toasted sesame seeds. Toss until everything is well coated and combined. 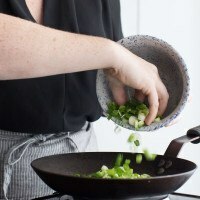 Serve with extra tamari, sesame seeds, and minced scallion greens. 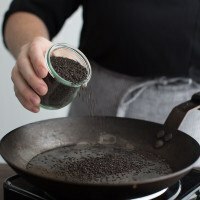 + To toast sesame seeds, place in a dry skillet and cook over medium heat, stirring often, until sesame seeds are slightly fragrant, 3 to 4 minutes. I use this sauce combination at least once a week, sometimes more. 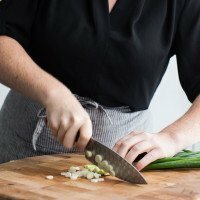 It’s easy to throw together, I always have the ingredients on hand, and the flavor compliments a wide array of vegetables. Noodles: Use whatever type of Asian Noodle you might have on hand: udon, somen, or brown rice noodles would all work. Spicy: Add a small scoop of sambel oelek or sriracha to the sauce. It’s the perfect way to spice up the overall dish. 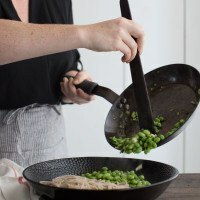 Miso: I’ll often add a couple of teaspoons of brown rice miso to round out the sauce but left it out of the recipe because I don’t always have it on hand. 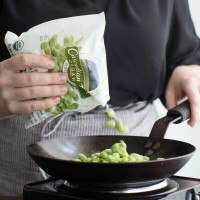 Edamame is one of those items that I keep in my kitchen year round and actually prefer the shelled version over the unshelled (primarily for ease of use). 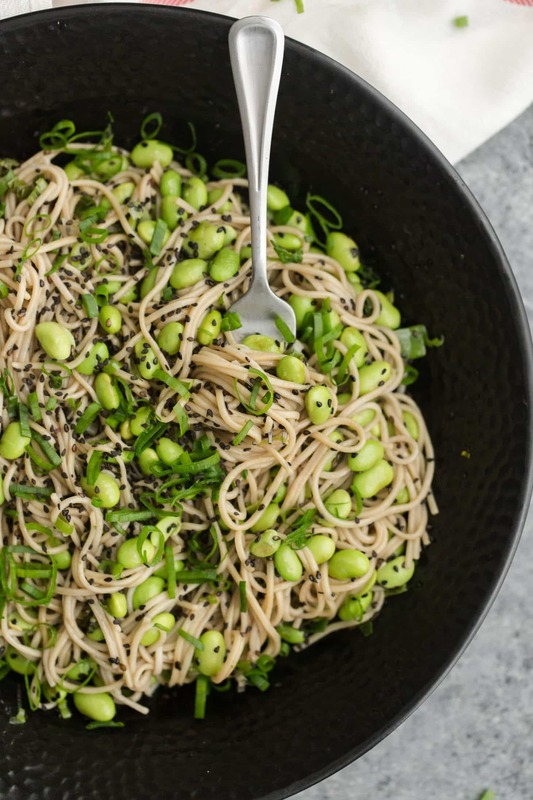 I love edamame tossed in salads, grain bowls, and of course, noodle bowls. Keep a bag in your freezer and never be without a go-to meal again! I have had shelled edamame lurking in my freezer for ages and do not pull it out often enough! Thanks for the delicious idea for what to do with it. This looks like a delicious yet easy meal. Especially good when staples are low before weekly shopping. And, I always look at the edamame in the freezer and passing it by for something else. This looks like a great way to use it. Thanks for the great recipes, Erin. Excellent! I Just wanted to comment on the photos, good work using the colors and plating. I love food photography, it’s a hobby of mine and your pictures caught my eye. 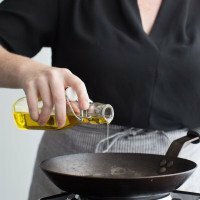 Can you clarify the distribution of the 3 teaspoons of sesame oil? If 1 tsp goes over the noodles, & 2 tsp go in with the scallions, then how much goes in with the rice vinegar? Thanks! Looks great. I want to make this for a party – do you think I could make it a few hours before and then refrigerate, or is it best served immediately? I think you would be fine to do that- it’s nice as a hot or cold noodle bowl!